Cyrus can solve anything! Whether it be puzzles, mysteries, or riddles. If there's a problem to be solved Cy's your guy! But in this orginal musical, Cyrus meets his match; Math Class. 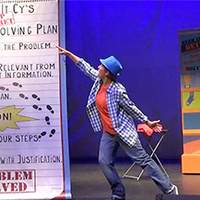 Come along as Solve it Cyrus and his friends learn the ins and outs of all things math in "The Aftermath of Math Class". Students and teachers alike will learn what makes math fun in this delightfully charming musical adventure! Study Guide coming!